Cricket Wireless. She's also the PR Rep for Storm Reigns Productions a woman owned film Production Company. Kym also works with local artist, models and actors by writing bios, creating press kits and artist development. I had the pleasure of interviewing Kym Nelson last year and her interview was so well received that I wanted to do a Follow up interview with her. You can check out my previous interview with her here: http://3375magazineinterviews.blogspot.com/2012/07/kymberly-nelson-kymberly-nelson.html. 3375 How did you get into Public Relations? KYM As I stated in my first interview with 3375 Magazine, I joined an all female motorcycle club in 2006. I gained popularity almost instantaneously. The club thought that I would be a great Public Relations Officer for the club. Our club gained notoriety quickly. Since leaving the club, I was often contacted by other clubs, small businesses, artists, models, Storm Reigns Productions and ultimately; Eddie Kayne, Radio Personality to represent them. 3375 Tell us what Public Relations entails? KYM A Public Relations Representative is contracted to sometimes create and always protect the image of their client(s). Unfortunately, the role that most people know PR Reps for is damage control, making sweet lemonade out of sour lemons. There is more to the job though: the Public Relations Representative will also craft press releases and help direct the content of publicity campaigns. 3375 Roughly, how many hour do you work per week? KYM I work around the clock for my clients. I have two clients that I am currently working with. I am the PR Rep for Eddie Kayne. He has the #1 Independent Radio Show that is viewed all over the US in addition to 96 countries world wide. He is my #1 client at this time. I also work with Storm Reigns Film Production Company. Storm Reigns is a woman owned company based in the DMV area and is currently shooting their first film this spring. 3375 What do you find interesting about PR work? KYM Public Relations work allows me to do everything that I love to do. I love to write. I love people. I love networking. I love the art of persuasion. I know, that sounds kind of weird lol. Taking on new challenges excites me. I enjoy creating opportunities for my clients, it's extremely rewarding! 3375 What are the key skills to being a great pr? KYM A Public Relations Rep has to have great written and verbal skills (as well as persuasiveness in both), a good manner with the public, networking skills, and a really good understanding of the media. Ultimately, the goal is to create, pitch and sale a positive to image to the public about your client in addition to promotion and finding financial opportunities for the client. 3375 Tell us about the Eddie Kayne show. KYM I am very proud to work with The Eddie Kayne Show. Eddie and I went to High School together. So, I’ve known him for a very long time. He has always been a pretty popular guy. His show gives independent artist(s) of all genres’s a platform to showcase their music. Eddie started out in the DMV music scene back in the day dancing for DC Scorpio and battling other dancers like P. Diddy when he went to Howard. He was a popular figure in the Go-Go scene as well. Eddie is pioneer in the DMV music scene which solidifies him as a Radio Personality for Indie Music. His radio show is #1 world wide. His show is sponsored by Cricket Wireless. Eddie Kayne is not only doing huge things for Indie Artist in the DMV area but World Wide. I think that is an amazing accomplishment especially, for an Independent Radio Show. I admire Eddie Kayne and look at him as a mentor. I love working with #TeamEddieKayne. The Show continues to get bigger and bigger. Eddie Kayne Show has a lot in store for everyone. Stay tuned! 3375 What part of your job do you find the most challenging? KYM I would have to say dealing with some Artist is the most challenging part of my job as a PR Rep. Many want something for nothing and don’t understand the business. They’re quick to slander your reputation when they don’t get their way. But, that is only a few bad apples. Most of the Artist(s) are very supportive and great to work with. I love working with the hungry artist who puts in the actual work, invest in themselves and grind hard. 3375 How has the new media landscape changed how you do business? KYM Social Media has made my business easier. Social Media has been proven to be the best Marketing tool there is at this day and age. You can advertise and promote to thousands of people all over the world in a matter of seconds, just by a few strokes of your keyboard. 3375 How do you maintain sustainable relationships with the media? KYM Support is key! When you support and show love to others, they tend to support you. 3375 Are there busy and quiet periods during the year? KYM I don’t know about others, but I am always busy. My clients and I have to keep food on the table. 3375 What would you recommend to a college graduate to help start their career? KYM Well, my degree is in Accounting. As a Public Relations Rep, I am self-made. I researched Public Relations. Studied it in my past time. Then applied what I learned. However, I would advise college graduates with a degree in Public Relations, to intern while in school. It’s always best to get the experience while in school. Put together a plan. After graduation, put that plan in action using the connections you gained from your internship. 3375 What's your favorite quote? 3375 If there is someone who would like to hire you for PR Work, how do they contact you? KYM This time around, I would like to S/O my family first; My Mom, Dad, Daughter Danche, Nieces and Nephews. Huge S/O to Eddie Kayne, Niki Ro, Tea the Songbird, Authenic Sounds, Vivian #TeamEddieKayne. I would also like to S/O Sarah Harris Founder of Storm Reigns Productions, Frances, Joy, Chiffon, Tasha, Teneshia, Kuumba aka DMVMuscle, BZell, DelDada, DBlac, DC Delegate, DC Young Rebel, OverTymeSimms and last but not least Jay Ceo of Ryde4mine Ent and 3375 Magazine! Thank you for reading! Please feel free to leave a comment and tell us what you think. 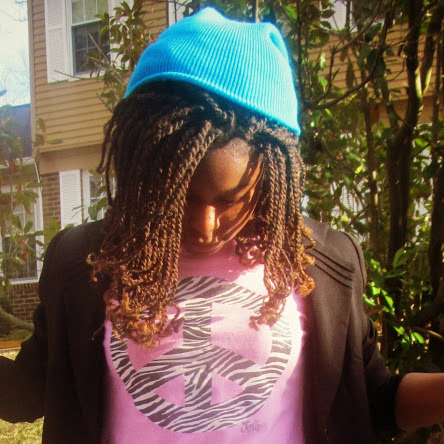 Crystal Anokam, known by her stage name Young Royal, is a young aspiring American Christian hip-hop artist. She may be young, but she is restless to praise the Lord. Her sole goal is to spread His word through her music. Young Royal was born in Washington D.C. on July 7, 1996 to Nigerian parents Fidelis and Gladys Anokam. Eldest and only girl of a family of four children was raised in Bowie, Maryland. As child she loved music. Ironically, she despised rap. “It’s funny how I used to hate rap music in my younger years because they talked too fast and it was hard to catch the words they would say, but now it’s my life. I love it,” says Royal. Lecrae’s “Don’t Waste Your Life” was the start of Royal’s love for rap music. There began the journey of Rap Music. In 2009, Royal was sent to Nigeria to go to school. She attended Chosen International Secondary School in Mgbidi for two years. There she began write poetry something she did for leisure and in her spare time. To her they were the closest thing to music since they were not allowed to bring any electronics to the school. After writing her Junior Waec in 2010, she switched scenery and started schooling at Infant Jesus Academy in Asaba. As poet, she became known as Shylock. The name came because she was quite timid and quiet – at least until you got to known her. Royal began turning her poems into raps then into songs. The rap game started when she joined a group of girls called the Cyclones. They wrote a song called Dirty Money Flows In. The Cyclones performed at the school’s Carnival Night. There began the dream of becoming a rapper. The seed was sown. Upon returning in 2011 to the United States to resume school Royal searched for an identity. Who was she? As sophomore at Bowie High School, she began to discover Christian rap and hip-hop – from Lecrae to Kj-52 to Young Chozen to Tye Tribbett and much more. In 2012, Royal changed her rap name from Shylock to Koncept. She joined a rap group at her church – Divine Grace Mission – called JFL (Jesus for Life). She was the only girl in the midst of boys. She was featured in the JFL Anthem song. By March 2012, she left the group changing her name to Young Royal. Royal realized that God had a purpose for in life and that was to share his word. She chose to share it through music. She currently resides in Bowie, Maryland and is the Youth President and member of the Music Ministry at her church. Royal also plays guitar for her school’s Gospel Choir. She is also part of group called Royal Girls with her two friends in Nigeria. Her hobbies include playing the guitar, reading and singing. 3375 Tell us your name and where you from. CRYSTAL My name is Crystal Anokam but I go by the name Young Royal. I am a Nigerian American born in Washington DC on July 7, 1996 and raised in Bowie, Maryland. My parents are Nigerian. CRYSTAL I am 16, turning 17 in July. 3375 You began to share the Gospel through the form of hip hop in 2011, please tell us your story on what lead you to making this decision? CRYSTAL In my younger years I had actually preferred listening to rock and alternative more than hip hop which is ironic because now I love rap and hip hop though I do still listen to rock and alternative just not as much as before. I got into hip hop because I loved the style of music but not the content of music and I felt that needed to be changed. One day as I was on YouTube I came across Gospel artist Lecrae’s “Don’t Waste Your Life.” And I was like wow! That was the very first time I had heard a gospel rap. It spoke to me. I’ve heard of just normal raps and at that time my favorite rapper was Eminem. But after that I was like he’s music didn’t have anything that could actually impact my life. Gospel music had lyrics that made sense that could change lives and that was what I wanted to do – I wanted to spread God’s word through my music. 3375 How did you get started in hip hop? 3375 What make you stand out from other artist? CRYSTAL Well first of I would say because I am a young female rapper and the gospel rap industry is composed of mainly men. Which would make people say, “hey she a girl but she’s really good.” Secondly, my love of God and with his favor I know most definitely he love and infinite love and affection showers over me. 3375 What challenges do you face as a gospel artist? CRYSTAL One of the major challenges I face as a gospel artist is persecution. Yes! I love what I do but sometimes it is honestly hard to get most people to like it because we are in day and age where people don’t care about God. So trying to get people to get back on track is where the real challenge lies. Then the negative comments on my music and personality sometimes set me back. They hurt but it’s my motivation to get heard and make Jesus famous! 3375 Where do you think the gospel rap industry is now and where would you like to see it go? CRYSTAL The Gospel rap industry is actually in a good place right now. An increasing number of people are starting to hear more gospel rap songs put out there than before. I would actually like to congratulate those who aren’t afraid to show who they are and spread God’s word and love through their music. I would love to see more females in the gospel rap industry in the future. CRYSTAL God is the hugest inspiration in my life. Without him I wouldn’t be able to do anything. Without His strength, His love, His mercy, His guidance, his protection I am nothing. Lecrae is who got me to even like rap so he’s another inspiration to me. In fact, the whole 116 Clique. 3375 What's the first thing you do when you get up in the morning? CRYSTAL When I wake up in the morning, I thank God for waking me up. I thank him for his guidance and protection over I can’t breathe without him. 3375 How do you think you will overcome the challenges of getting more media exposure? CRYSTAL Hmmm that’s a tough question. 3375 What as been your biggest accomplishment? CRYSTAL My biggest accomplishment is yet to come. My mixtape Here I Am Vol.1 is yet to come. That right there will be my biggest accomplishment. CRYSTAL In the next 5 years, I see myself on a stage doing what I love. I see myself graduating from college. 3375 Tell us something we don't know about you. CRYSTAL I love writing poetry and spoken word. I love listening to classical music. I’m actually a huge fan of Shakespeare and Mozart. CRYSTAL Shout out to my family, for being a huge support! Shout out to my bros Testafi and 2edge. Shout out to my church family, Divine Grace Mission. Shout out to my crew JFL. Shout out to the Cyclones. Shout out to my bros Testafi and 2edge. Shout out to Jay Thomas for giving me the privilege to be on his blog. Shout out to God for giving me this purpose in life. Thank you. Thank you for reading! Please leave a comment and let us know what you think!